China and the US slapped $34 billion worth of levies on each other’s exports last Friday, and the markets said, “yeah, whatever,” and marched higher. The question is, why? Market moves often baffle investors, but this one shouldn’t. Fundamentals are strong, corporate profits appear to be rising nicely, the trade skirmish represents a tiny portion of overall GDP, and stocks have been punished for six-months straight. Add to those small incidentals such as the market’s P/E falling by about two handles, as well as these tariffs already being priced in, and you have the recipe for a nice rally. From my perspective, part of the reason we’re seeing stocks move higher is that 2nd quarter earnings season is on our doorstep. Some of the largest US banks report earnings this Friday, and that’s going to finally redirect the attention of investors. Instead of allowing the algorithms to trade haphazardly off news headlines, tweets and the mood across social media, which all seem to have been negative lately, investors will once again refocus on the only thing that matters: corporate profits, and their outlook moving forward. So what are investors expecting to see? Okay, 20% year-over-year is great, but won’t investors be concerned by the fact that earnings growth is slowing? The short answer: Yeah, probably. But strong earnings growth is strong earnings growth, and there are some subtle signs that this quarter may see better than expected numbers. 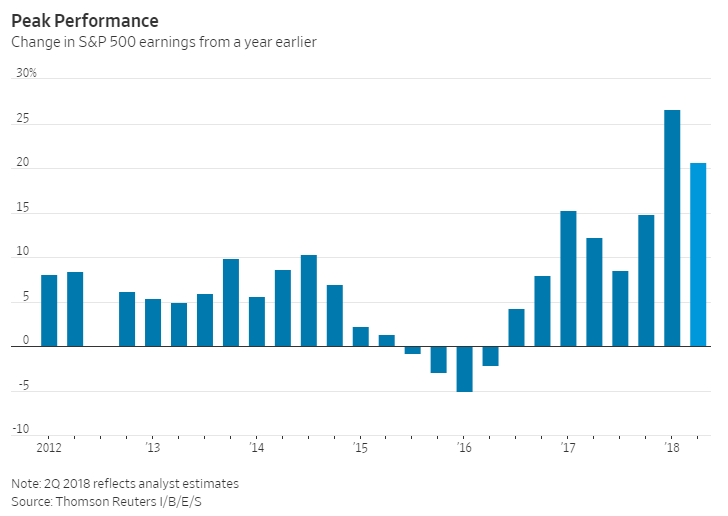 The first indication of this is the fact that earnings estimates have risen throughout the course of the quarter, which is rare. Second, the ratio of negative to positive earnings announcements right now is 1.4. Since 1995 that average has been 2.8. This suggests that companies are doing better than we might otherwise suspect. Of course, no one except the insider traders know how earnings will really evolve, but we could be pleasantly surprised. After all, the economic reports that we’ve seen a point to solid expansion. Speaking of the macro data, there are two approaches that analysts use to come up with their earnings estimates for a given quarter: top-down and bottom-up. The bottom-up approach is probably the most familiar to investors, as it entails analyzing companies one by one to estimate their earnings, then summing these up to arrive at an aggregate figure for the S&P 500 or other cohorts. The top-down approach is much different and relies on an understanding of the macroeconomic environment. This method uses factors such as estimated GDP growth, inflation, interest rates and a host of other indicators to assess how much companies in aggregate are likely to have grown their earnings. As you might expect, the estimates arrived at by both these methodologies are often quite different. But not this time. Consensus bottom-up earnings estimates for 2018 currently sit at $159 per share, the same as Goldman Sachs’ top-down estimate. As for 2019, those figures are $175 and $170, respectively. This does not guarantee that earnings for 2018 will be robust, but it’s comforting when various forecasting approaches all yield roughly the same result. In my opinion that increases the likelihood that those forecasts will ultimately hit their mark.